/mo. for 12 months plus taxes, fees. DISH Satellite TV service requires a 24-month commitment and credit qualification. Prices & specials may vary by service area. Not all products, prices and services available in all areas. 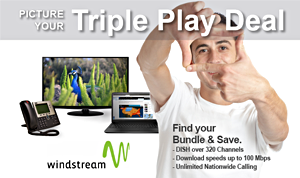 Windstream's Triple Play Package serves up the popular DISH America’s Top 200 plan, Windstream's Enhanced Speed Internet 25 Mbps + Unlimited Phone with unlimited local and nationwide calling. DISH America's Top 200 offers 200+ channels to delite your family. You can watch your favorite shows live or record them for later with one of the DISH DVR selections. Visit with your friends on social media, email, update your banking, go shopping, or share photos with family and friends with up to 25 Mbps internet knowing your connection is more secure and reliable with Windstream. Surf the internet all day and night with no data caps and talk endlessly without long distance charges on your phone or overages on your cell plan. Watch live and recorded TV you get at home, available anywhere, on any device with the DISH Anywhere app. cancel call waiting if you are on a call and do not want to be interrupted. ring tone. A unique call waiting tone will also apply to the programmed numbers. Speed Calling 30 - Allows you to program up to thirty numbers for speed dialing with an abbreviated code. it Standard, Enhanced, Premium, Premium Plus, or GIG there is never a data cap with Windstream. It may be possible to use an existing Windstream modem or a modem/router that has worked on another DSL provider's network. Please note that Windstream technical support cannot provide configuration or troubleshooting assistance on non-Windstream equipment. DISH set-top boxes and other DISH equipment are necessary to bring the programming to your TV. Windstream Shield Lite - $8.99 (Monthly fee) *Amount excludes taxes and fees. Windstream Shield Standard - $11.99 (Monthly fee) *Amount excludes taxes and fees. Windstream Shield Premium - $14.99 (Monthly fee) *Amount excludes taxes and fees. Showtime® You’ll get the series everyone is talking about like Homeland, Ray Donovan and Billions, plus hit movies, sports, and comedy specials. $10.00 (Monthly Fee) Or FREE for 3 months with qualifiying package. STARZ® STARZ is the ultimate destination for obsessable TV, movies and more. From bold Original Series like Power and Outlander to the best movies, whatever you love, STARZ ignites your passions. $10.00 (Monthly Fee) Or FREE for 3 months with qualifiying package. DISH Movie Pack™ Get 15 movie channels, including EPIX, FXM and more. $10.00 (Monthly Fee) Or FREE for 3 months with qualifiying package. $10.00 (Monthly Fee) Or FREE for 3 months with qualifiying package. What are the minimum requirements and supported operating systems that Windstream supports for Internet service? Windstream's Broadband Help Desk will be happy to provide you with the settings for these type of connections, but we cannot provide technical support for setup, configuration, or troubleshooting of non-supported operating systems/devices. **DISH - New customers only. All offers require credit qualification, 2-year commitment with early termination fee and eAutoPay. **After 3 months, you will be billed $40/mo. for Cinemax, Showtime, Starz, and DISH Movie Pack unless you call or go online to cancel. DISH America's Top 200. With 200+ channels there is something for everyone in the family. All the channels in America's Top 120+ channel line up are included PLUS you will get more sports and other varieties. Look forward to NHL Network, NBA Network, MLB Network, The SEC Network! Family favorites like Disney XC, Bravo, A&E, Sundance, ESPN, local channels and regional sports are all included. Windstream Enhanced Speed Internet 25 Mbps provides a download speed of up to 25 Mbps for staying in touch online with friends on social media, web surfing, downloading music and movies. As always with Windstream Internet, your connection is more reliable and secure. You can stay online all night long without worrying about data caps. Call today for this great deal!